Using the events of 9/11 and Pearl Harbor as his backdrop, T.H. 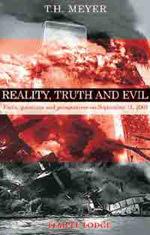 Meyer studies questions of reality, truth and evil, offering important new perspectives. He shows that Anglo-American political practice (influenced by secret societies such as Skull and Bones) is based on an ideology of polarity and conflict. Meyer offers instances of this tendency, encouraging what Huntington famously referred to as a 'clash of civilizations'. For example, a week before George Bush senior spoke in Congress about the need for a 'new world order', a 'humorous' cartoon map in the Economist divided the world's continents into religious and philosophical blocks, creating a new region called 'Islamistan'. n 1997, Brzezinski wrote openly of US geostrategic plans, stating that it would be hard to achieve such goals "except in the circumstances of a truly massive and widely perceived direct external threat". This, apparently, was granted with the events of 9/11, and the subsequent launch of a 'war on terror'. The immediate comparisons, led by George W. Bush, with Pearl Harbor demand a reassessment of the events of 1941. Meyer points to conclusive evidence which suggests that Roosevelt deliberately provoked the attacks and failed to pass on intelligence to US Navy chiefs. Could it be possible that certain members of the US elite likewise deliberately remained passive before 9/11? Why, only two weeks after the attacks, were celebrations held at CIA headquarters in which Bush profusely thanked the secret services '... on behalf of the American people'? In contrast to the divisive thinking and "conflict-management" of leading representatives of the Anglo-American elite (inspired by a contorted reading of some basic insights of the philosopher Hegel), the author shows how the holistic approach of Rudolf Steiner and Mabel Collins offers a radical, alternative way to deal with polarities, leading to the overcoming of conflict. T.H. MEYER was born in Switzerland in 1950. He is the founder of Perseus Verlag, Basel, and is editor of the monthly journal Der EuropÃ„er. He has written numerous articles and is the author of several books, including major biographies of D.N. Dunlop and Ludwig Polzer-Hoditz. He also edited Light for the New Millennium, Rudolf Steine'r's Association with Helmuth and Eliza von Moltke.